Cell Phone Holder, Lazy Bracket, The clip-on holder is clipped onto any desk, mobile stand for the bedroom, office, bathroom, kitchen. Maneuverable with a 700mm/28inch long gooseneck flexible telescopic arm holder, position phone at the right distance and angle for convenient viewing. 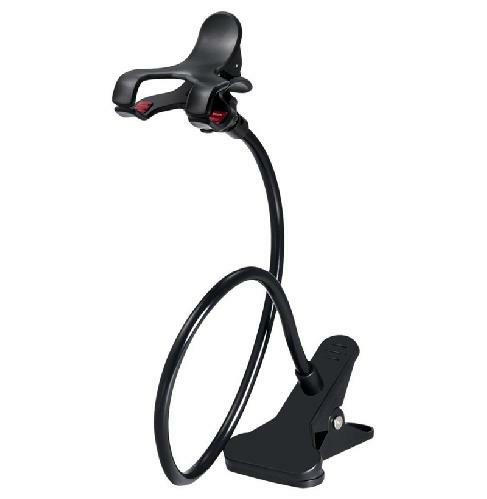 Suction cup stick-on mount with 360-degree swivel ball head provides you a horizontal or vertical viewing angle. Cell Phone Holder, Perfect for view phone & enjoy music & phone games in the bedroom, gym, office, exhibition and more, Fit for most cell phones up to max width 90mm. Mobile Phone Holder, Compatible with iPhone 6, 6 plus, 5, 4s, 3gs, iPod, GPS, PDA, Samsung galaxy, HTC, Nokia, LG, blackberry etc.